Donald Rumsfield, US defence secretary at a press briefing during 2002 has stated “There are known knowns; there are things we know we know. We also know there are known unknowns; that is to say we know there are some things we do not know. But there are also unknown unknowns – the ones we don’t know we don’t know”. Uncertainties are the things that are unknown unknowns. Uncertainty can be defined as unpredictable events in manufacturing environment that disturb operations and performance of an organization. Presently organizations are functioning in environments which combine known knowns, known unknowns and unknown unknowns. The growth of the last category presents organizational management with a new and little charted management challenge. Sometimes risks are equated with uncertainties. 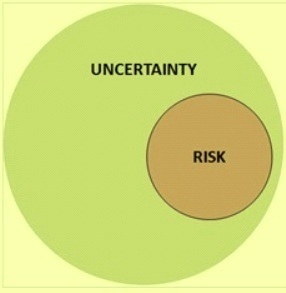 But uncertainty is much more than risk and it encompasses risk in it as shown in Fig 1. Every organization has to pass through several periods or many situations of uncertainties. Periods of uncertainties are an inevitable aspect of most organizations, but even the most proficient managements have difficulty in handling these periods. They use decision milestones to anticipate outcomes, risk management to prevent disasters and sequential iteration to make sure everyone is making the desired product, yet the organization still ends up the periods of uncertainties with unfulfilled plans, overflowing budgets and compromised outcomes. Uncertainties may exist in practically all decision making situations. Nevertheless, in spite of the profound and partially irreducible uncertainties and serious potential consequences, policy decisions have to be made. Logical decision support helps the management in developing and choosing a course of action, given all of the uncertainties surrounding the choice. There is little appreciation for the fact that there are many different dimensions of uncertainty, and there is a lack of understanding about their different characteristics, relative magnitudes, and available means of dealing with them. Some studies have referred to the uncertainty as disturbance. Regardless of the terms used, these studies complemented each other in a way that aims to minimize the effects, as uncertainty and disturbance result in unpredictable changes in the organizational environment. Uncertainty exists when details of situations are ambiguous, complex, unpredictable, or probabilistic; when information is unavailable or inconsistent; and when management feels insecure in their own state of knowledge or the state of knowledge in general. Uncertainty also might be experienced when management assesses the probability of an event. A curvilinear relationship exists between beliefs about probability and uncertainty, such that uncertainty is lowest when the probability of occurrence is believed to be 0 % or 100 % and highest when the probability of occurrence is believed to be 50 %. Management experience increasing uncertainity as likelihood of an event occurring or not occurring becomes equal. If multiple alternatives are possible, uncertainty is highest when all events seem equally probable. Uncertainties can be either short lived or ongoing. Short lived uncertainty can be for the duration of a limited event. Ongoing uncertainty continues for a period of time. During ongoing uncertainty, the uncertainty may transform suddenly as one issue is resolved and another takes its place. Also the subtle meaning of uncertainty during ongoing uncertainty may shift over time as organizational management become accustomed to it. Because uncertainties are multi layered, interconnected, and temporal, the appropriateness and effectiveness of responses used to manage them are likely to vary across context and situations. The layers of context suggest that management experience multiple sources of uncertainties at once and manipulation of one type of uncertainty can impact uncertainties of other types. Communication is important aspect in the uncertainty management. It helps managing uncertainty that is challenging. Managing uncertainty is essential for maintaining hope. Uncertainties are fact of life and a better understanding of the different dimensions of the uncertainties and their potential impacts on the relevant policies, help the management to take appropriate decisions and helps in identifying and prioritizing the actions. This leads ultimately leads to better policies. Uncertainties may be due to lack of knowledge or due to the variability inherent to the systems of the organization. However uncertainty is not simply the absence of knowledge. Uncertainty may occur due to situation created by inadequate information, which can be of three sorts namely inexactness, unreliability and border with ignorance. Uncertainty can also prevail in situations where a lot of information is available. Further, new information can either increase or decrease the uncertainty. New knowledge on complex processes may reveal the presence of uncertainties that were previously unknown or were understated. Underestimation of uncertainties can lead to strategies that neither defend against the threats nor take advantage of the opportunities that higher level of uncertainties may provide. At the other extreme, too much importance to uncertainties can lead managers to abandon the analytical rigour of their traditional planning processes altogether and base their strategic decisions primarily on gut instinct. Managements who become conscious to uncertain environments donot trust their gut instincts and suffer from decision paralysis. They avoid making critical strategic decisions. Hence no attempts are made to face the challenge of uncertainties. At the heart of the traditional approach to strategy lies the assumption that by applying a set of powerful analytical tools, management can predict the future of the organization accurately enough to allow them to choose a clear strategic direction. Most of the uncertainties usually contain a lot of strategically relevant information. It is often possible to identify the clear trends. Further there are usually a host of several factors, which are currently unknown but those are in fact knowable. These factors can be known provided the right analysis is done. The uncertainties which remain after the best possible analysis has been done are what is called residual uncertainties. Residual uncertainties faced by management for strategic decision making falls into one of the following four broad levels. Level 1: Clear enough future – At this level, management can develop a single forecast of the future that is precise enough for strategy development. Although it is inaccurate to the extent that all the organizational environments are uncertain, the forecast usually sufficiently narrows to point to a single strategic direction. In other words, at level 1, the residual uncertainty is irrelevant to making strategic decisions. Level 2: Alternate futures – At this level, the future can be described as one of a few alternate outcomes, or discreet scenarios. Analysis cannot identify which outcome will occur, although it may help establish probabilities. Most important, some, if not all, elements of the strategy would change if the outcome was predictable. Level 3: A range of futures – At this level, a range of potential futures can be identified. This range is defined by a limited number of key variables, but the actual outcome may lie anywhere along a continuum bounded by this range. There are no natural discrete scenarios. As in level 2, some, possibly all, elements of the strategy would change if the outcome was predictable. Level 4: True ambiguity – At this level, multiple dimensions of uncertainty interact to create an environment that is virtually impossible to predict. Unlike in level 3 situations, the range of potential outcomes cannot be identified, let alone the scenarios within the range. It might not even be possible to identify, much less predict, all the relevant variables that will define the future. Level 4 situations are quite rare, and they tend to migrate towards one of the other levels over time. However they do exist. 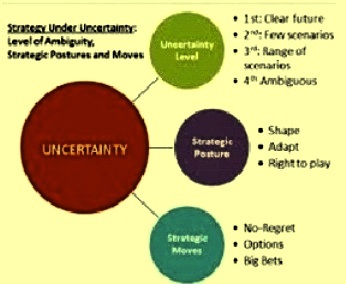 There are three strategic postures and three fundamental types of actions under uncertainty that an organization can undertake. In terms of strategic postures, the organization can either (i) shape the future or play a leadership role in establishing how the industry operates, or (ii) adapt to the future, being flexible in recognizing and capturing opportunities in the industry, or (iii) reserve the right to play, namely invest sufficiently to keep afloat, avoiding premature commitments. The three fundamental types of actions, necessary for strategy implementation are as follows. bets or actions that necessitate a significant commitment on the part of the organization, generating a positive return under a favorable scenario and having a negative effect in other scenarios. Each of the strategic postures and actions may deem useful depending on the level of uncertainty and specific circumstances facing the organization. At the same time some of these tools are more useful than others.